If the cause of your back pain seems to be motion between segments of your vertebrae, spinal fusion may be a way to prevent motion and stop the pain. 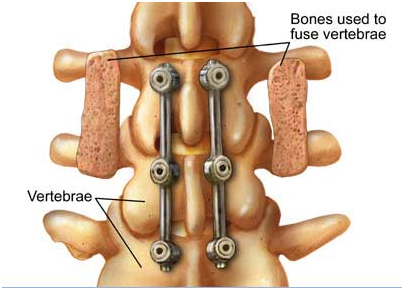 Spinal fusion involves permanently connecting - or "welding" - two or more vertebrae together. Spinal fusion was formerly used primarily for conditions such as scoliosis and other spinal deformities. Today, although most people with chronic low back pain don't need to undergo spinal fusion, it has become increasingly popular for treating low back pain. The number of spinal fusions for all causes in the United States has more than doubled since 1993. Spinal fusion has been used as a treatment for what's called discogenic pain - pain originating in the area of a particular disk and without involving leg pain (sciatica). Before you and your doctor agree to surgery as an option, your doctor will want to make sure that you've given nonsurgical treatments a reasonable trial. Also, your doctor may conduct a study called a diskogram, which is a special X-ray examination that involves the use of a dye. The dye, injected into a disk, serves to make it appear better on an X-ray. The injection of dye may also produce a pain similar to your ongoing back pain, which helps your doctor pinpoint that disk as the source of your pain. Spinal fusion permanently connects two or more bones in your spine to improve stability, correct a deformity or treat pain. In this case, bones, rods and screws are used to fuse vertebrae. Spinal fusion surgery requires general anesthesia. The procedure may take from two to 12 hours, depending on how extensive the surgery is and the technique your surgeon uses. Surgery may involve a large incision, or may be done using newer techniques with smaller incisions. To fuse the spine, your doctor needs small pieces of extra bone to fill the space between two vertebrae. This bone may come from your own body (autogenous bone), usually from a pelvic bone. Or, it may come from another person (allograft bone) by way of a bone bank. If the front of your spine is fused, the disk is removed first. Bone graft substitutes, such as genetically engineered proteins, are being developed as alternatives to using bones from your body or a bone bank. Sometimes, doctors also use wires, rods, screws, metal cages or plates. As with any surgery, spinal fusion carries risks, including pain at the donor site for the bone, infection and nerve injury. Expect to be in the hospital for several days after surgery. You'll also likely experience considerable pain and discomfort after surgery, but your doctor will control pain with oral and intravenous medications. It takes from several weeks to several months to heal from this surgery, depending on your age, condition and what level of activity you plan to return to. The type of healing that needs to occur after spinal fusion is comparable to recovery from a broken bone. The earliest that X-rays might reveal bone healing after spinal fusion is about six weeks. Spinal fusion removes some spinal flexibility. This can be beneficial if movement and instability between spinal segments is what causes your pain. However, the fused spine needs to be kept in proper alignment. You'll be taught how to move, sit, stand and walk in a manner that keeps your spine properly aligned. You may be able to start a physical rehabilitation program as early as about four weeks after spinal fusion surgery. Beyond the immediate potential risks of spinal fusion surgery, the areas of your spine adjacent to the fusion will bear more stress. This makes those areas more likely to experience future wear and tear. That may mean you'll need to undergo surgery again. About 20 percent of people who have spinal fusion surgery need another operation within 11 years. Also, like any treatment for back pain, don't expect spinal fusion to eliminate your pain - just to improve it. For example, if your level of pain on a scale of 0 to 10 was a 7 before surgery, your doctor might regard a reduction to a pain level of 3 or 4 to be a successful result. More study is needed regarding the long-term efficacy of spinal fusion to treat discogenic pain. A study published in the May 2005 issue of the British Medical Journal concluded that people who are candidates for spinal fusion may obtain benefits similar to those of surgery from an intensive rehabilitation program. A 2007 systematic review of several studies, including the 2005 British Medical Journal study, stated it wasn't possible to reach a definitive conclusion about whether fusion surgery might be effective in treating discogenic pain. The review did state that the nature of nonsurgical treatment of back pain "may be critical" in determining whether it's a better approach than fusion. A 2004 opinion article in the New England Journal of Medicine stated that "the emphasis of research efforts should shift from examining how to perform fusion to examining who should undergo fusion. The indications for this invasive and expensive procedure remain unclear despite its rapidly expanding use." A 2007 article in the New England Journal of Medicine addressed the issue of who needs back surgery, and concluded that for people with major disability or major spine trauma, surgery "may preserve life or function." However, "absent major neurologic deficits, patients with herniated disks, degenerative spondylolisthesis, or spinal stenosis do not need surgery, but the appropriate surgical procedures may provide valuable pain relief." At the time you and your doctor discuss whether you're a good candidate for spinal fusion, he or she may mention a newer option - disk replacement therapy. The Food and Drug Administration approved this therapy in 2004. However, it's still too early to know the long-term outcome of disk replacement therapy.